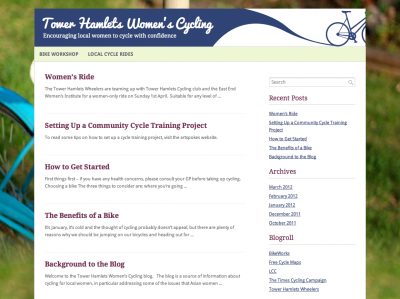 The Tower Hamlets Women's Cycling blog has evolved from the Fieldgate Bike Project, set up by Sarah Hammond in 2011. Working with women and young people on the Fieldgate Mansions Estate in Whitechapel, East London, the aim of the project was to help them discover the joys of riding a bike and provide cycle training. The social and physical benefits of cycling have also been a focus, as many women within the community experience isolation, as well as illnesses, such as heart disease and diabetes. The blog has been set up as a hub where local women, especially Asian, can access information about rides, where to receive training, cycle safety and how to buy a bike. Contributors from the cycling community will also be on hand to respond to questions and comments. For more information contact: Sarah Hammond or Annabel Leathes. Wheelers are looking forward to getting involved with the blog project starting with helping to organise a Women's Ride on Sunday, 1 April. A video of the problem can be seen here. TfL has once again created a dangerous and intimidating environment that comprehensively fails to balance the needs of all road users by overtly favouring motorised modes over pedal cycles, and cars over buses. This is a completely unacceptable position from TfL. Where for the sake of expedient movement of motor traffic they have created a dangerous situation on a carriageway where cyclists legally have equal rights to travel and equal rights to safety as with other road users. Cyclists have been told off to “use the superhighway”, which leaving aside their deficiencies, is not an equivalent route. If you are a cyclist using this junction, or if you have views about this junction’s changes, please get contact Gerry Matthews, Campaigns Officer for Tower Hamlets Wheelers. Remember to include your full postal address when contacting your MP about any issue. I am writing to ask if you would be prepared to support the Times "Cities fit for Cycling" campaign, and the London Cycling Campaign's "Go Dutch" campaign. For the former, are you able to support Early Day Motion 2689, or attend the associated debate on 23 February? I believe that increasing the modal share of cycling in London will contribute to an improved quality of life for all who live and work in the city - this is because it will help reduce pollution and noise and will ease overcrowding on public transport. In addition, if people feel it is practical to switch to using a bicycle for daily transport, they will benefit in terms of fitness (in the long term reducing the burden on the Health Service) and financially (particularly important for low-paid workers for whom travel-to-work costs form a major part of their expenditure). However, the current state of London's cycling infrastructure deters the majority of Londoners from switching to cycling on the grounds that it is too dangerous. A number of recent incidents in Tower Hamlets (e.g. the recent Bow Roundabout fatalities) make this an understandable position. Cycling in London has increased in recent years, but is still far below the levels achieved in "best-practice" cities, and I believe the level will soon reach a plateau because the majority of Londoners - many of whom would like to use a bicycle - believe it is just too risky. Unfortunately the Mayor of London has delivered a number of poorly-engineered and under-developed schemes during his period of office. The flagship Super Highway scheme is poorly implemented, and does little to give cyclists confidence. Schemes need to be properly engineered, and properly funded. I believe the current approach to providing cycle facilities in London needs to be challenged, and these campaigns are a good way of doing this. Full details of the campaigns are at: http://www.thetimes.co.uk/tto/public/cyclesafety and http://www.lcc.org.uk/pages/go-dutch. The Times campaign contains an 8-point manifesto calling for cities to be made safe for cycling, and the LCC campaign calls for infrastructure to be engineered to a similar standard to the Netherlands - with clear space for cycling along major roads in all London boroughs. Whilst these two campaigns are focussed on cycling, I believe that they can also bring substantial benefits to pedestrians as well. Better cycle infrastructure would reduce conflict between cyclists and pedestrians, and reduced motor traffic would make London's environment more pleasant for walking. As a member for an inner London borough, where congestion, traffic noise, pollution, health problems arising from lack of exercise are all important issues, and where many residents are on low incomes, I hope that you are able to support these campaigns. I would be interested to hear your views on the subject. Your support will be used to persuade candidates in the 2012 London mayoral election to work towards a city where everyone can cycle and walk safely wherever they want - a London that's simply a nicer place for ordinary people to live, work and get around. There will be events and rides over the coming months to promote this campaign and of course Tower Hamlets Wheelers will be getting involved. Join us to help London change for the better. We have received queries from people regarding the Hire BIkes Scheme roll-out in Tower Hamlets, as people are noticing that the docking stations are being installed. The list of locations is not finalised yet (some are subject to planning applications and others may have to be relocated or withdrawn) but the scheme is expected to go live in March 2012. Currently, the furthest East the cycle hire scheme goes is Whitechapel and Wapping. The extension will add 2000+ bicycles to the East End, and will include locations such as Canary Wharf, Mile End, Isle of Dogs and Poplar. We would be very interested in hearing from anyone in Tower Hamlets considering using the Cycle Hire scheme for regular and occasional journeys, especially where journey time and convenience are improved when compared with bus or DLR alternatives. 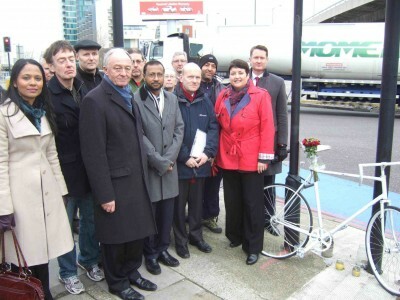 Bow Roundabout Update, Ken Livingstone visits Bow, Stuck in Tower Hamlets, Go Dutch - read now. At the site we spoke about the problems for cyclists and pedestrians and then demonstrated them by crossing with difficulty to a community hall. Here we expanded on the issues cyclists face with inadequate road planning along the CS2 route. The solution THWers feel could be found in positive examples from the Netherlands and we spoke to and urged the mayoral candidate to endorse the Go Dutch campaign launched by the LCC for the Mayoral elections. At a "Tell Ken" event in the evening, during transport questions, he told a Tower Hamlets audience how bad things were at Bow. He showed good understanding of issues and possible solutions, drawing on his vast experience as Mayor and working with TfL. We have planned another of our popular weekends away, returning to our old favourite Palace Farm Hostel in Kent. See the Weekend Away page for more details. The Wheelers have had a great year of rides. We've managed to complete 40 rides in total. The most popular was the Vineyard Ride with 32 riders. The least popular was the Afterworker 3 ride, with just 2 (they all count!). The longest was London to Brighton at 70miles. We even had a scary middle-of-the-night frightride. Thanks to everyone who came out to ride with us and a special thanks to everyone who helped out in some way. We'll be back again with more rides in 2012, we are currently working on our calendar. Keep an eye on the website and the email list. In the meantime here is an infographic with a summary of what we got up to in 2011. See you in the new year, Keep Riding! On 24 October, Brian Dorling, 58, was killed whilst cycling eastbound along Barclays Cycle Superhighway (CSH) 2 at Bow roundabout, East London, adjacent to the Olympic park site. On 11 November, Svitlana Tereschenko, 34, was killed cycling on the same roundabout though travelling westbound. Both were hit by left-turning lorries as they attempted to head straight on. On 22 November the Mayor of London met the deceased's families and announced a Transport for London investigation into HGV safety. As a public relations drill to deflect blame from the poor design of sections of the cycle superhighways (CSH) this announcement is an exemplary exercise in professional crisis management by TfL. Regarding these two deaths, London commuter cyclists who use this route regularly do not believe the issue lies solely with the vehicles concerned but with the shockingly bad CSH blue painted lane leading around the outside of the roundabout. This lane requires cyclists using it to pass across the northern roundabout exit lane leading to a slip road onto the A12 (A102M). The same applies on the southern side across the exit lane with cyclists again encouraged to aim towards a segregated section on the outside of the roundabout. A competent cyclist (as one who uses this route needs to be) travelling east-west should be taking the centre line as they approach this roundabout, just as thousands of commuter cyclists have been doing every day for years. Since the painted blue CSH and associated filter lane have been implemented two cyclists have been killed at a similar spot. There is an entire library of professional literature advising on how to deal with cyclists at roundabouts, from the Design Manual for Roads and Bridges to Cycle Infrastructure Design, which itself at para 9.8.1 states: "Keeping well to the nearside on the circulatory carriageway is the typical approach adopted by less confident cyclists, but this puts them in the most hazardous position for being hit by vehicles entering or leaving the roundabout. They are less visible to motorists entering the junction, and this is where most conflicts occur." On CSH2 at the Bow roundabout where the two recent deaths have occurred this is the very position that the CSH positions the cyclist! During site meetings prior to its implementation members of my group of London Cycling Campaign activists (Tower Hamlets Wheelers) specifically advised TfL officers against installing this type of facility at this site, as did independent consultants from Jacobs attending the same site meetings. London cyclists have long recognised that TfL will not counter losing motor vehicle capacity over safe provision for vulnerable road users, which would have been the result at this site had the signalised system recommended by both cyclist stakeholders and Jacobs been implemented. TfL has not made public the report in how it concluded the current Bow roundabout design was a workable solution, and how the comments of stakeholders and Jacobs came to be dismissed. It would be enlightening to read this report. The Mayor and TfL‚s response to these deaths is, as noted, to announce a review of construction industry HGVs in London, and the press release did include a sub-announcement about a review of junctions. While the issue of HGV operation and safety is not to be underestimated, and HGVs have been found responsible in a number of high-profile cyclists deaths in London recently, many of London's cyclists believe that in these two cases this is being used as, at best an opportunity to shift the blame for the recent deaths at Bow away from the design of the CSH and onto other vehicle users, at worst it is disingenuous and cowardly on the part of TfL. This CSH2 is the closest route to the Olympic Park but last week TfL's director of better routes and places, Ben Plowden, said that cyclists heading to the Games would deliberately be directed away from this roundabout if they are riding to the Park; an open admission that this section of CSH2 does not provide the "safer, faster and more direct journey" that Cycle Superhighways have been introduced to provide. The original London Cycle Network (LCN) plan made too much use of half-baked facilities relying on painted lanes, when that was scrapped the resulting London Cycle Network Plus proposed to do the same on a smaller scale. That was scrapped in favour of the more PR-minded CSH, which uses much of the same routes as the LCN and LCN Plus but has, for the most part, simply changed the colour of the paint. 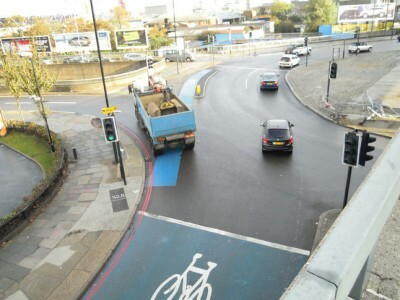 Whilst Bow roundabout has never been a good experience for cyclists to use I believe this junction could be made safer overnight simply by removing all of the existing CSH paint and filter route infrastructure and returning it to its condition prior to the installation of CSH measures. TfL officers responsible for the design of this section of CSH need to apologise for this dreadful facility and immediately work to remove it and then install a safe design for all users. How to do this is sitting in a year-old report on their shelf. Bow Roundabout: Demands for action on safety, Tour du Danger - 10 most dangerous junctions ride, Ride Highlights, Conservatives meeting, Jenny Jones visit... - read now.